The arrival of commercial print in the 19th century, across the subcontinent allowed for the emergence of the professional writer, one who could make a living from writing alone. Where professional poets and writers had earlier subsisted on patronage from kings and nobles, the 19th century created opportunities for a writer to make a living from the market. It also, however, forced the writer to turn entrepreneur, to become an editor of a self-owned journal, to become a publisher and even set up a printing press to do the same. Bharatendu Harishchandra in Hindi, Ratan Nath Sarshar in Urdu and Bankim Chandra Chatterji in Bengali are prime examples of the writer as entrepreneur. They not only wrote books but also brought out their own periodicals and journals, and published their own books too, and subsisted largely on their writing. These writers were creators and products of a modern literature and modern print-based literary cultures that this generated. This literary culture was modern in the sense that it was imbued with modernity, with the notion of progress, of liberty and equality and a vision of historicism. Some have seen this to be a ‘vernacular modernity,’ derivative like the anti-colonial nationalism, others have seen this as secondary to the colonial imperative of using English as a disciplinary and hegemonizing tool, and still others have seen this literature as being oppressed by the burden of its inadequacy. However, following Sudipto Kaviraj, Dubrow finds that the modernity that was the hallmark of this literary culture was expressed, at least in Urdu, and in Hindi and Bengali, through its ability and eagerness to satirize, to mock. This attitude was also reflected in its penchant for irony and parody. 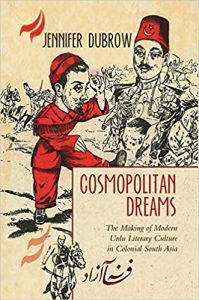 It is not Jennifer Dubrow’s case that satire did not exist in pre-colonial literary cultures, but that it became the hallmark of this new literary culture and was deployed to new uses and against abstractions that had come to dominate the colonial discourse. Jennifer Dubrow’s new monograph on the growth of modern Urdu literary culture breaks new ground in three aspects. Shifting focus away simply from books and poets, it highlights the importance of periodicals, journals and newspapers in the creation of a unique literary culture. Print and the commercial print revolution of the 19th century, and the new secular communities this engendered, thus becomes central to the evolution of this literary culture. She also breaks new ground by highlighting the importance of readers and consumers, manifold to a copy, in the construction of this literary culture. Finally, she defines this literary culture as the ‘Urdu cosmopolis’ which was not specific to a region, community or caste but instead describes ‘how Urdu readers and writers imagined themselves as citizens of an Urdu-speaking, transregional, yet non-national community that was global in outlook and consciously resisted national borders or religious identities.’ This new literary culture rested on the modern forms of technology such as the Railways, the Telegraph and the Postal System, all brought in by the colonial state for its instrumental purposes but put to different usages by South Asians who wanted to contest the colonial hegemony. The suppression of the 1857 uprising forced a reconciliation to the colonial regime for north Indians. For Urdu writers this coming to terms involved a radical interrogation and even wholesale rejection of their literary past. In revising this past, Urdu writers enthusiastically adopted colonial diktats for literature, that it should be ‘instructive,’ in the moral sense and that it should be ‘useful.’ The fanciful, ‘conceited’ and terribly useless word plays, literary flourishes and self-absorption of the past, went the cry, must perforce give way to poetry and prose that was useful. Reformers such as Altaf Husain Hali and Mohammed Husain Azad, following Sir Syed Ahmed Khan’s lead in political adjustments, exhorted a new light, which engendered a naturi movement. All past practices needed to be reformed, poetry must be simple, sincere, natural (including, above all, moving descriptions of nature) and novels should be didactic. Much has been written about this ‘prize-winning adab’ and how influential it remains to this day. Indeed the two most influential works of Urdu literature, still an indispensable part of the curriculum in the present day, were composed by Azad and Hali respectively. This enduring success, and its enduring harm, has been an important feature of the recent oeuvre of Shamsur Rahman Faruqi, the most influential contemporary Urdu writer. Building castles in the air…Self-interest. Not fulfilling your promises…Oppressing the weak and fearing the strong. Exaggerating your imaginative power. Self-praise. Worshipping expediency. Taking pride in imagined victories over enemies. Being a yes-man. Chasing the weak and joining the strong. Making excuses. Warming yourself with someone’s burning house. It is a cliché of present day, beleaguered, Urdu literary culture in India to assert that Urdu is a secular (sic) language, that it doesn’t belong to any specific community, that it is non-denominational et cetera. It is to Dubrow’s credit that she is able to demonstrate that this cliché actually rests on very strong historical practices. The Urdu literary culture in the 19th century made universal claims and addressed concerns that did not belong to any specific State or community. This intensified in the 20th century with the rise of the Progressive Movement in literature. Maulvi Abdul Haq may have claimed that it was Urdu that created Pakistan, but the Urdu writer of his time was securely global in his outlook and appeal. In his letters to Uncle Sam, to take just one example, Manto acted as a global citizen, commenting on affairs that concerned the entire world. A majority of the Urdu writers of his times, and for many decades thereafter, wrote of themes, peoples and situations in ways that transcended religion and region. Most of them wrote for a pan-Indian audience. In our times too, there is a global audience for Urdu, a diaspora that transcends the boundaries of India and Pakistan, of Muslim and non-Muslim. I am grateful to Dubrow for including the revival of Dastangoi as a key aspect of this contemporary Urdu performative culture. The strength of this contemporary performative and digital world Urdu culture lies in its freedom from traditional barriers of authority. Readers and writers who do not know the Urdu script are also free to participate in this community. But while freedom is bliss, ignorance of norms can also lead to mistakes. Like Dubrow, I too have read Urdu, more than I have heard it. Hence I also often make mistakes of reading as found in her book, for example, writing correspondence as khat kitabat whereas it is pronounced khat-o kitabat, translating parda e saz as curtains of the instrument whereas the word parda also means a musical note or the frets of a guitar, writing duniazad as dinazad, and writing buzna, meaning monkey, as buz nah. The chauvinism of the Ahl-e Zaban, alas, does not easily vanish. Mahmood Farooqui is a Delhi based writer best known for reviving Dastangoi, the lost art of Urdu storytelling. His latest book is A Requiem for Pakistan: The World of Intizar Husain (Yoda, 2016).